2. What's the worst motorcycle you've ever owned? A GSX-R1100 streetfighter. It looked nice but didn't handle at all. I'd have a garage full. A Harley, an off-roader and a nice sportsbike. 4. What's your favourite stretch of road? A nice stretch as you leave the M4 round the back of Henley. 5. What's the best thing you ever did on a motorcycle? I'm going on a mad ride in Russia in a few weeks from Moscow to St. Petersburg. Overtaking people through London's congestion is the most satisfying. But I think the best experiences are yet to come. At the National Water Centre in Nottingham there's a two-metre wide strip of road. I went along it on the back of a ZX-10 at 150mph with no helmet and in T-shirt and shorts. 7. What's the worst thing that has ever happened to you on a bike? Falling off. I had an FZR1000 and came off at a roundabout. I was all right but the bike slammed into a wall. I heard it grinding along the road and I remember thinking, 'that's gonna cost me'. 8. What do you hate in motorcycling? People who ride white motorbikes with reflective clothing 'cos I think they're all policemen. 9. Who's your motorcycling hero? Mick Doohan or Rossi for the awesome way they ride. 10. What motorcycle did you first do 100mph on? 11. What is the most miserable time you've had riding a bike? Riding back in the snow, freezing cold and I got stopped by the police. I had a Walkman on which they didn't like. I got out my driving licence and I hadn't signed it! 12. What would you do with your last gallon of fuel? Use it to get to the next garage. 13. What's the fastest you've ridden? 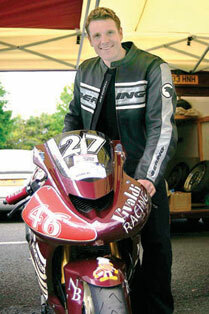 Just over 160mph when I had an R1. Gloves, as I always have a fear of hurting my hands. Natural talent over hard work. 18. What are the trends in your field that are just below the horizon? Less endurance training and more intensive training - short'n'hard. Something with an engine for once. A lot of our sponsorship is bonus-related so if we win we deserve it, if we don't, we don't.